I am still sewing some long sleeved clothes as I am going on a cruise soon and expect the temperatures to be cool most of the time. After winter a lot of my tees (and dresses) are looking tired so I figured I needed a few new ones for the cruise. I had previously bought this divine striped fabric from Crafty Mamas and after sewing stripes recently where the fabric was skewed, this fabric was like gold. So lovely to handle, straight grain and beautiful recovery. These fabrics are not inexpensive but the quality is soooo worth it! This time I wanted to make the Ottobre raglan tee (5/2013 #4 - Monday basic). I made a size 40 and love this style. I did not really follow the instructions for the neckline. 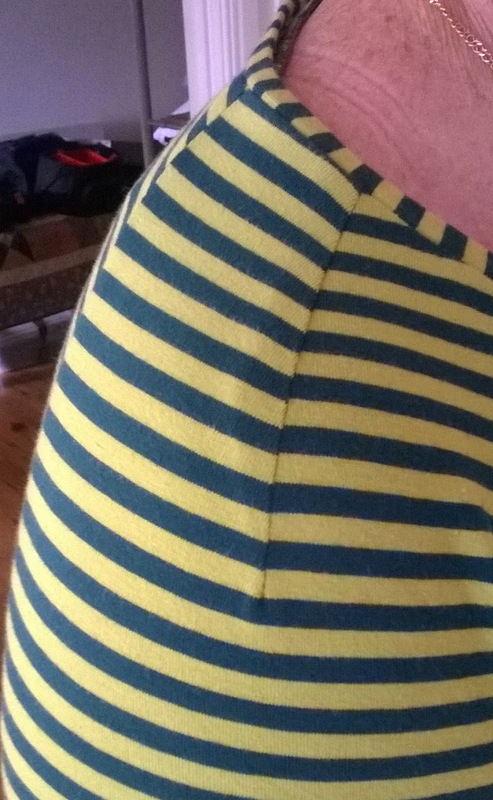 Ribbing is recommended but I used the same fabric as the tee cut the other way to make the stripes a feature. I used the piece recommended for the facing for View B (the dress version) and did a pretty standard tee shirt binding. Other than that I made the tee shirt pretty much to the instructions. I like the dart on the top of the raglan sleeve that gives the shoulder a nice shape. I matched the side seams really well but the raglan only matched so-so but the one pictured in the magazine is the same, so I figure that is the nature of the raglan shape. 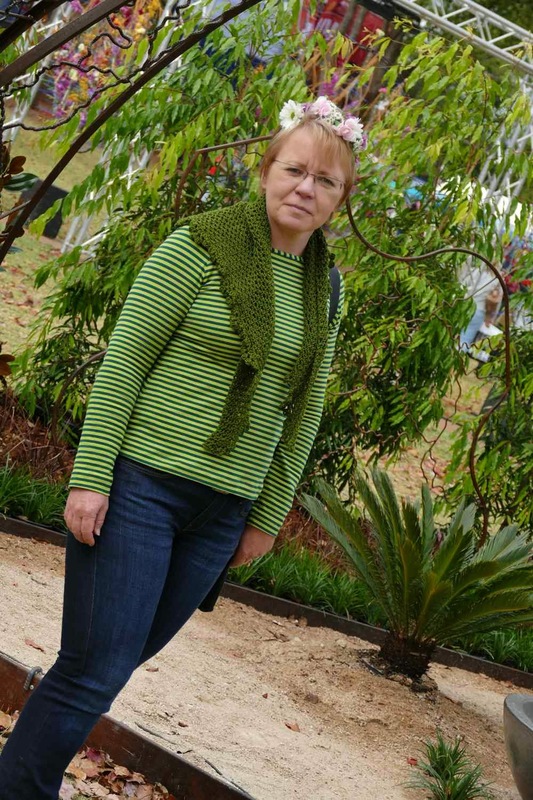 I have paired it this day with my dory crocheted scarf. It was a really cool spring day and the cotton scarf was a perfect weight to keep the cool breeze off my neck. 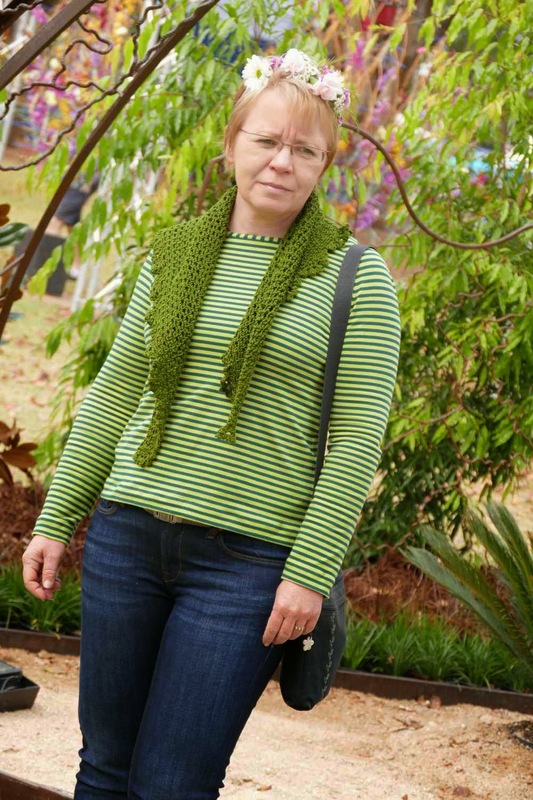 I love the way the green scarf works with this top. I don't know why I don't look too happy in these photos. I had a great day and loved what I was wearing. I think I may have been a bit cold as I took my cardigan off for these photos. 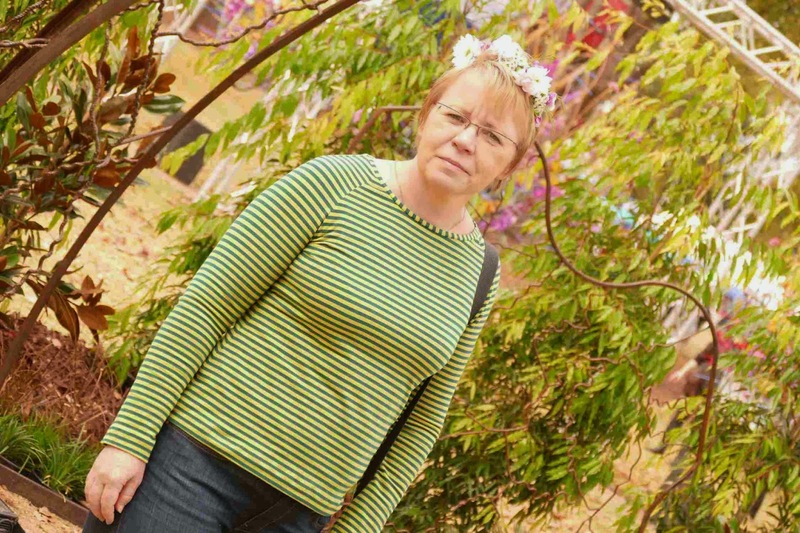 Oh and if you are wondering about the flowers in the hair, I was at the Food and Wine festival which is part of our town's flower festival. They had a stall where you could make your own flower crown... so much fun and everyone looked lovely walking around with flowers in their hair! I wish I could wear flowers in my hair everyday! Ciao for now - I have also made the dress version of this pattern so back with photos (as soon as I get them)! That is a lovely top. Great colour. Nice stripes. Great top and beautiful scarf. I too am a convert to Ottobre patterns; they really fit well. Thanks for the info Crafty Mamma's fabric. Like you I get fed up with stripe knit fabric where the strips are all off balance. Enjoy your cruise. Love your striped top and the scarf looks perfect. I love raglan t-shirts, and this is a great one, I think you can tell that it's a nice beefy good-quality knit.